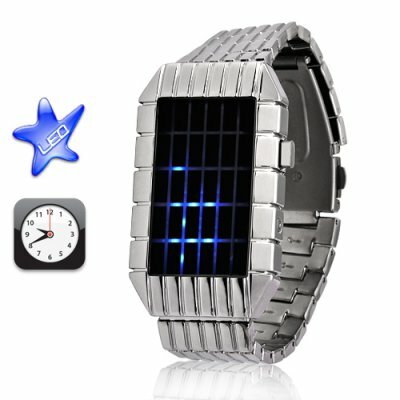 Successfully Added Cryogen - Japanese Style Inspired LED Watch to your Shopping Cart. Introducing The Cryogen, a Japanese LED watch born of a resultant fissured tesseract from the expansionary collision of the Cthulhu universe and...Buffyverse. The Cryogen imbues its wearer with the ability to wield pure will and reshape reality by expostulating Time and Space as philosophical constructs governed by a solipsistic modality. You mean this watch really tells the time? Yes. Even though The Cryogen embodies Fatal Fury style and Mortal Kombat design with its blue Silmaril pulses encased in polished Mithril like a blue-capped and tunic wearing Link wandering around Dante's Inferno, this Japanese LED watch does in fact tell the time and does so really efficiently too! Stop trying to check out my watch dawg, yo pass me a Heineken! I can wear it to a wedding or on Fridays when I dress casual! Yo, the Cryogen is the best and that's foshizzard! The Cryogen's skillset will also empower you to dance in the rain instead of waiting for storms to pass and write the entire works of Shakespeare in 14 point Helvetica on a tiny grain of rice. But lest you undo yourself through hubris as Macbeth did do, there is a limit to what you can do with this amazing timepiece. As such, you will not be able to microwave a burrito so hot that you can't eat it. C-walk empress Anika and Korean super rapper MC Sniper are said to be Cryogen owners, as are rising Swedish sensation Lykke Li, cooking genius Jamie Oliver, and Ukelele impressario Jake Shimabukuro. In reality this watch is perfect for people who have spent their entire lives looking for a special wine called Genra, who started off not liking Leonardo DiCaprio but was won over by his sterling performance in Blood Diamond. Which begs the question...if the plot of Inception was driven by Cobb's need to return to America to see his kids, why didn't he just have Michael Caine fly the kids out to see him???? Anyhoo...if you know all the lyrics to "Easy Lover" by Phil Bailey and Phil Collins then the Cryogen watch is for YOU. Dear Reseller Sirs, please buy your samples as soon as possible for in a mere 60 days, this amazing product will be sold with a 10 piece MOQ (minimum order quantity). Thank you. This watch has self display which means you can program it to display the time every 10, 20, 30, 40, or 50 minutes. The Cryogen comes with 7 levels of LED brightness. You mentioned that this watch is perfect for people who have spent their entire lives looking for a special wine called Genra, who started off not liking Leonardo DiCaprio but was won over first by his performance in Blood Diamond, and then of course Inception. What if I don't belong to one of these groups? This watch is also perfect for Gwen Stefani fans, people who didn't like Harry Lennix as Commander Lock in The Matrix Series but did like him as Boyd Langton in Dollhouse, Nintendo fanboys whose favorite stage in Mario Kart 64 is Wario Stadium, and anyone who loves Jack Handey jokes.